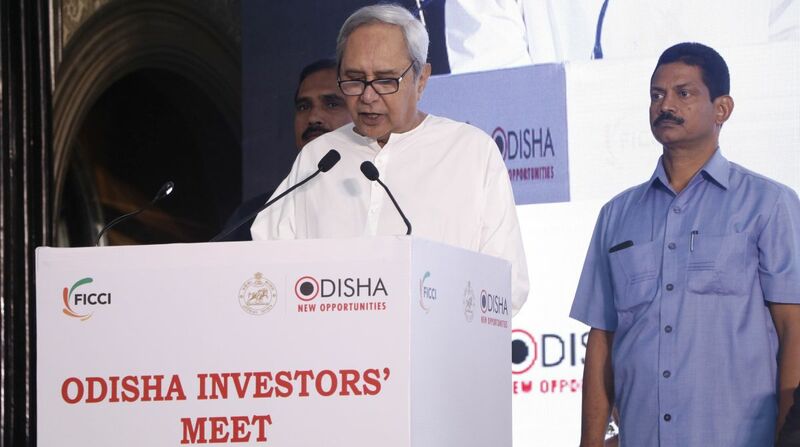 Odisha Chief Minister Naveen Patnaik launched the “I am Odisha” campaign at a road show in Mumbai on Wednesday to attract investors to the state. He announced that a World Skill Center with an 18-floor infrastructure was ready in Bhubaneswar. The campaign — a run-up to the Make in Odisha Conclave 2018 scheduled for November — was organised by FICCI. Official sources said the CM had meetings with industrialists Mukesh Ambani, Anand Mahindra, Kumar Mangalam Birla, Adi Godrej, Gautam Singhania, Kishore Biyan lined up. Business leaders from over 300 leading companies participated in the roadshow to explore growth opportunities across Odisha’s focus sectors — food processing and seafood, ancillary and downstream industries in the metals sector, textiles, ESDM manufacturing, chemicals, plastics and petrochemicals and tourism. “I am Odisha” also provided a platform for Odias to share their success stories. The CM promised “unmatched facilitation support” as he invited investors to participate in the Make in Odisha Conclave. “Odisha is emerging as the ‘Manufacturing Hub of Eastern India’, and we aim to develop the state in to a ‘Manufacturing Hub of South Asia’,” he said. Patnaik said Odisha had been increasingly attracting manufacturing projects with more than 118 large projects approved with an employment potential of 1,28,572 in the last four years. “The average time taken for approval to the projects has also reduced to 20 days from the date of receipt of the completed project application,” he said. During the meetings with investors, the strategic advantages of Odisha were highlighted such as the low cost of doing business, incentives for investors, dedicated sector-specific clusters and over 1,25,000 acres of land bank available for industrial development. The industrial infrastructure at National Investment Manufacturing Zone (NIMZ), Kalingnagar, food processing park at Khurda and Chhatabar, textile and apparel parks at Ramdaspur and Dhamnagar, aluminium park at Angul and plastics park at Paradip was presented to the investors. The CM had held a similar meeting with investors in 2016 ahead of the first Make in Odisha Conclave. “The strength of Odisha lies in its vast resource base, long coastline, assured power and water supply, port-driven development, excellent road network and connectivity, a young and skilled workforce and an industry-friendly and result ­oriented responsive government,” he told the captains of industry. The first edition of the Make in Odisha Conclave evoked enthusiastic response with announcement of over Rs 2 lakh crore of investment intents. About 65 per cent of the projects are at various stages of approval and implementation. “Paradip is one of the largest and fastest growing ports of India. Dhamra port is fast emerging to add strength to the port-led manufacturing base. Apart from these, deep-water ports along the East Coast Economic Corridor, we have also approved the first riverine port project of Odisha to be setup on Mahanadi River in Kendrapara district,” said Patnaik. “Come, Join the Juggernaut,” he said in his concluding remarks while inviting the industrialists to invest in Odisha. Industries Minister Ananta Das and a high-level team of officers accompanied the CM.